Many of us get excited about just thinking about barbecues. Nothing gives a better feeling than the smell coming from cooking a lump of meat on a bright summer day. From the point of view of a pit master, the anticipation that he or she gets from the guests as they cook and serve is much more thrilling for them. The selection of the right kind of wood is one of the most commonly faced questions for any new barbecuer. There are various wood options available to serve the purpose of smoking meat. Most of these woods can be procured from any local supplier. But the most important aspect is to decide on what kind of wood would go along with what kind of meat. You should also know which pellet smoker has a large hopper capacity. 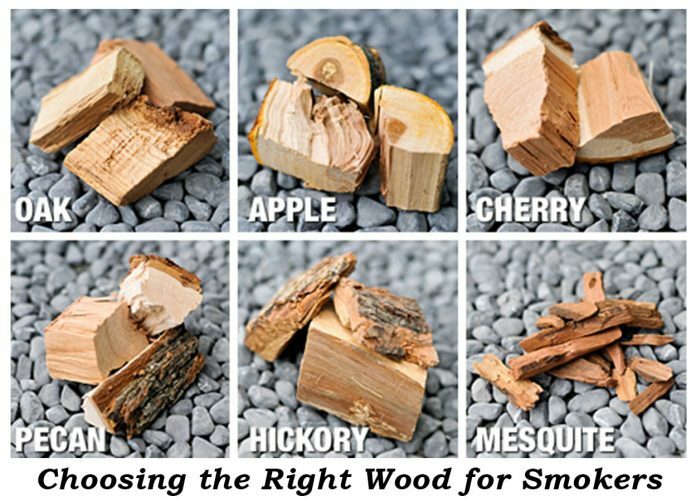 We the Grills Forever team, have prepared this Smoker’s wood selection guide for you to help you find the perfect wood for smokers. 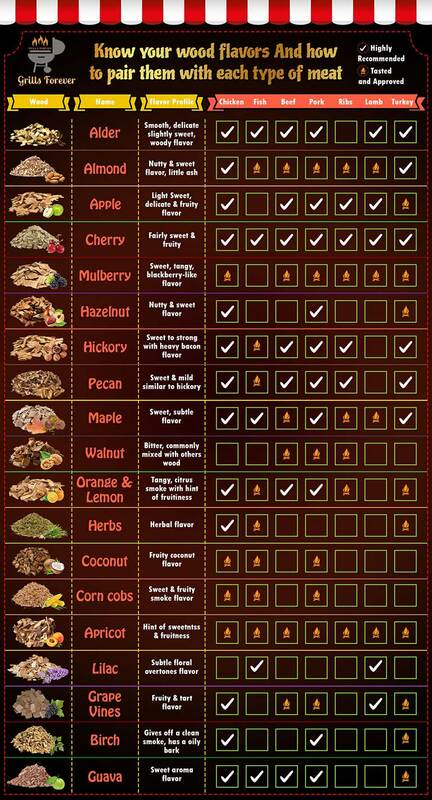 Here is a quick overview of different wood chips followed by their best uses in different types of barbeques. This particular kind of wood has gained quite some popularity on the Pacific coast. It’s smooth and slightly sweet taste makes it perfect for all kinds of meats such as chicken, beef, lamb, pork or even seafood. If you are new to BBQ grilling, alder is one of the safest options to go with. This wood has a very good nutty and little ashy flavor which go best with chicken, turkey and other kinds of birds. You can also try almond chips with ham or other meats if you are inclined to the nutty flavor, but our chef strongly discourages using almond chips with red meats. This particular kind of wood is known for its light smoky fruity flavor which suits poultry meat best. Apple chip also goes finely with red meats. Hickory is commonly referred to as the king of barbecue woods. It has a very pungent flavor, which goes well with chicken, turkey, and beef. you can also use hickory wood chips to smoke lamb or pork. However, it doesn’t go well with fish bbq. They are similar to apple wood in both use as well as flavor. A lot of smoke is emitted by crab apple. Hence it is advised to use it carefully till you quite familiar along with it. This is the most popular wood pellet amongst the smoking crowd. it has a strong sweet smoky flavor which suits almost every kind of meat whether it is chicken or pork ribs. However, if you don’t cherish the strong sweet flavor, this might not be the best option for you. This particular kind of wood works well with pork, poultry, beef as well as fish. It is known for producing a mild smoky flavor along with subtle citrus notes. It is not common to use coconut wood chips in barbecue. Coconut hulls are basically used along with only lighter meats like seafood. This particular kind of wood is known to provide sweet and fruity smoke. This fine flavor is extended to the meat, making it ideal for poultry as well as pork. This soft wood serves better as fuel and imparts very less flavor. Hence, it is better to use it along with another wood like hickory. This particular kind of wood goes well with any kind of meat due to its fruity and tart flavor, including game, red meats as well as lamb. When you are working with grape vines initially, it is better to use it quite sparingly. To obtain more subtle flavor try soaking the lightly flavored chips into some wine before smoking. This particular kind of wood is quite difficult to find and is found in tropical regions. It has partially sweet aroma as well as flavor and belongs to the Myrtle family. It works well with fish, beef, poultry as well as pork. It works well with chicken as well as pork and offers a hazelnut to the meat. Unique herbal flavor could be offered to the meats by using herbs line basil, oregano, rosemary, sage, marjoram as well as thyme. Sage and Rosemary chips, which are quite thicker work well due to their woody steam. Try to use it sparingly at first since herbs will strengthen the taste of lighter meats. Once you get idea about the strength of the flavor imparted by any particular herb of your choice, you can use it as you desire. It is quite similar to hickory in flavor but offer a robust yet subtle and sweet flavor. It works well with cheese, poultry, pork as well as beef. These possess a flavor that is similar to hickory. The only difference is in the fruits notes and milder smoke. These woods are ideal for smoking lighter meats such as turkey, fish, pork, and chicken. The flavor of the wood dissipates with time. If you want to flavor your meat, older supplies would not prove out to be effective. These sweet fruit woods are ideal choices of many people looking for wood for smokers. A cloud of very light smoke is produced by this wood. Its subtle floral overtones work great with lamb and seafood. 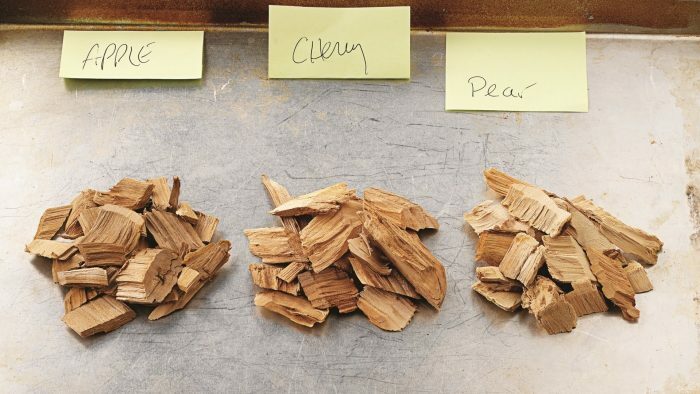 Maple wood chip is one of the most popular smoking choices in terms of bbq grilling. This wood produces a slightly sweet smoke with maple syrup overtones. This is ideal for poultry, pork, game birds and cheese. This wood is ideal for lighter meats such as poultry and pork. This is used in small amounts along with lighter woods because of its heavy smoke. Using more concentration can make it bitter. This is best for hearty red meats. While looking for right wood for pellet smokers, one needs to ensure that the wood chips are ready to be used and is well seasoned. You need to store freshly cut wood for smokers. Bulking will result in spoiling the wood pellets. While looking wood for smokers, try to purchase from reputed stores. Do not use soft woods as they produce resins and tars. That can ruin your smoker as well as the food. Previous articleTop Ten Easy & Simple Tips for Smoking! Must read! Next articleHow to Smoke Trout in 9 Simple Steps? After study a few of the weblog posts on your website now, and I actually like your approach of blogging. I bookmarked it to my bookmark website checklist and can be checking back soon. Pls try my website online as properly and let me know what you think. Keep up the fantastic piece of work, I read few blog posts on this internet site and I think that your site is very interesting and contains sets of good information. Excellent website. Plenty of helpful information here. I am sending it to several buddies ans additionally sharing in delicious. And obviously, thank you to your sweat! And advance welcome to your buddies in our family. Hope they like our write ups too. Hello my family member! I wish to say that this article is amazing, great written and include almost all important infos. I would like to look more posts like this. This comment really means a lot to us as you are considering yourself as a part of our family. Massively blessed. I do trust all of the concepts you’ve offered for your post. They’re very convincing and can certainly work. Nonetheless, the posts are very brief for starters. May just you please prolong them a little from next time? Thanks for the post. Generally I don’t learn post on blogs, however I wish to say that this write-up very forced me to check out and do it! Your writing style has been amazed me. Thank you, very great post. Yes we know we are awesome 😀 Keep on following us for more twists and tricks. Some truly fantastic content on this website , appreciate it for contribution. Good write-up, I’m regular visitor of one’s site, maintain up the nice operate, and It is going to be a regular visitor for a long time. Alright. Thanks for letting us know about your feedback. Thank you so much for giving everyone remarkably terrific opportunity to discover important secrets from this site. It is often so pleasant and stuffed with fun for me personally and my office mates to visit your web site not less than 3 times a week to find out the latest secrets you have got. Of course, we’re always impressed for the good techniques you give. Certain 4 facts in this posting are truly the most effective I’ve ever had. Wow, this article solved all my problems I was facing to choose wood flavors for my meat, now I know all of them, Specially the infographic you provided is really a nice thing to have, you can find everything looking at that! Keep carrying the good stuffs.